The woman wanted to have a dinner party with my fellow drunkards, so I stopped by BevMo for some interesting brews. 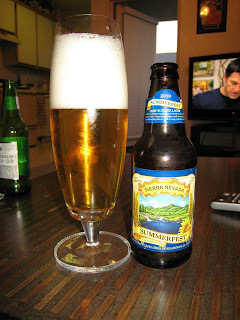 I was drawn to the Summerfest because no one is stupid enough to turn down a Sierra and I have never reviewed it. Double win. This has to be, without a doubt, the least hoppy Sierra product I have ever consumed. That being said, it still has a strong hop profile. I think Andy said it best: Smells like summer, tastes like winter. It has a nice floral citrus smell going for it, and is pretty damn pleasant. I am pretty happy I still have 2 in the fridge.